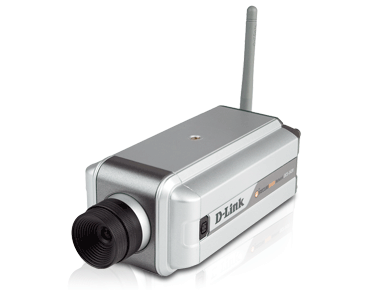 The D-Link® DCS-3420 Wireless Day & Night Network Camera is able to capture video and take snapshots in a variety of lighting conditions and is designed for the small to medium-sized business. The D-Link DCS-3420 Wireless Day and Night Internet Camera is designed for the small to medium-sized business (SMB) and home market to capture video or take snapshots in a variety of lighting conditions and provide remote monitoring capabilities over the Internet. 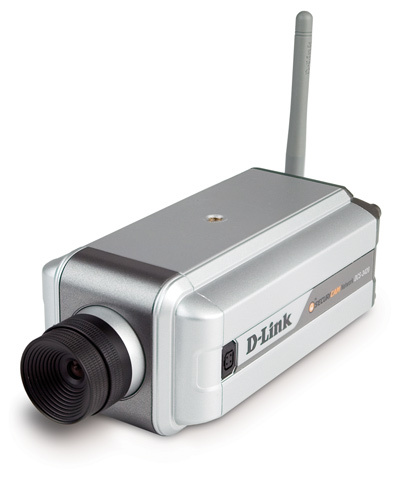 The DCS-3420 can be placed anywhere on the network either through a wired Ethernet or wireless 802.11g/802.11b connection to view the camera’s video feed. You can also instantly take snapshots while remotely viewing video feed from a Web browser. The DCS-3420 provides enhanced viewing capabilities with 4x digital zoom for close-ups3. With 0.5 Lux light sensitivity, The DCS-3420 can capture video under minimal lighting conditions. Furthermore, you can enable 2-way audio and talk to anyone within close proximity to the camera’s built-in microphone by connecting external speakers to the DCS-34202. Innovative software is included to enhance the monitoring and management of the DCS-3420. Simultaneously view up to 16 cameras at once, set up manual or scheduled video/audio recording to a hard drive, and set the camera to record or send e-mail alerts whenever the motion sensor is triggered. The DCS-3420 supports MPEG-4 and MJPEG video dual codec that can easily be viewed using Windows® Internet Explorer Web browser. Customize your surveillance application with the DCS-3420 by adding an optional IR illuminator to view and capture images at night1. In addition, the original lens of the DCS- 3420 can be replaced with another lens of your choice, such as a night vision lens, to enable monitoring in completely dark conditions1. Interchanging the day and night lens is simple, quick, and hassle-free. With a built- in BNC connector, video feed from the DCS-3420 can be transmitted on to a standard video security monitor or to any CCTV video server. By using the DCS-3420 (Wired Mode Only) with a D-Link DCS-40, DCS-45, DCS-50, or DCS-60 camera enclosure, you can easily implement outdoor monitoring. The DCS-3420 adheres to the Universal Plug & Play (UPnP™) specifications, which allows computers running Windows® XP to recognize the DCS-3420 and automatically add it to the network. The DCS-3420 can be accessed and viewed from “My Network Places” as a device on the network. By signing up with one of many free Dynamic DNS services available on the web, you can create a personal web address (e.g., www.mycamera. myddns.com) for your camera. This allows you to remotely access your camera and monitor your site without having to remember the IP address, even if it has been changed by your Internet Service Provider. Packed with advanced features and remote monitoring capabilities, enable quality video and audio surveillance in a variety of lighting conditions with the D-Link DCS-3420 Wireless Day and Night Internet Camera. 1. Additional lens and IR illuminator sold separately. 3. 4x digital zoom enlarges an image by magnifying the pixels in a selected portion of the image by 4 times.